In the not-too-distant future, as the Earth warms, the heat energy that churns our atmosphere could spark even more lightning than the 8 million that strike today. A new study published today in the journal Science suggests that we’ll see 12% more strikes for every 1˚ C of warming. Earlier models used cloud depth to determine how likely they were to generate enough energy to produce a lightning bolt. But climate scientist David Romps and his colleagues instead looked at precipitation, humidity, and temperature measurements taken from weather balloons. Put together, this data indicates how energetic an impending storm could be, and in turn, how probable it is that lightning bolts will streak through the sky. Scientists project that lightning strikes could significantly increase in frequency by the turn of the next century. 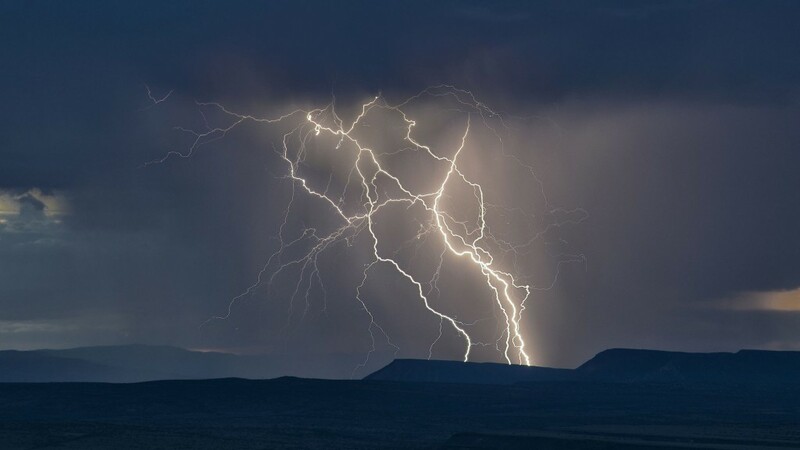 By knowing how much water is in the clouds and how much energy is available, Romps says his model can accurately predict how many lightning bolts will get generated. Typically, he says, about 1 per cent of the potential energy picked up by water gets converted to lightning, so by knowing how much water and energy is present, the team can work out how much lightning will form. They tested the model using real weather data from 2011, and compared the results with the data on every lightning strike in the US, collected by the National Lightning Detection Network. In simple terms, they found that it retrospectively correctly accounted for 77 per cent of that year’s ground strikes. “When I saw that result, I thought it was too good to be true,” says Romps. Romps and his team then applied their lightning model to 11 different climate models. In Romps’ model, lightning varies consistently with temperature and energy. Using that same math, he calculated the percent increase for every 1° C rise in global temperatures. At the extremes, some model runs even suggested that strikes could double by the year 2100. The team doesn’t know yet whether these strikes will cluster in particular areas, but one thing is for sure: increased bolts to the Earth’s surface means greater chance of wildfires and a shift in the chemical composition of the atmosphere. As well as triggering half of the wildfires in the U.S., each lightning strike—a powerful electrical discharge—sparks a chemical reaction that produces a “puff” of greenhouse gases called nitrogen oxides. “Lightning is the dominant source of nitrogen oxides in the middle and upper troposphere,” said Prof. Romps. And by controlling this gas, it indirectly regulates other greenhouse gases including ozone and methane. The result could be a vicious cycle: rising temperatures cause an increase in lightning strikes, thereby releasing into the atmosphere gases that perpetuate Earth’s warming even further. Of course, Romps’ model isn’t perfect—it doesn’t yet account for the fact that parts of the globe experience very little rainfall, nor does it factor in lightning strikes that don’t make it to the ground. The precipitation measurements could be made clearer, too. Right now, the model measures clouds’ water content and not its additional ice content. Nevertheless, it seems likely that someday soon, lightning will be even more prevalent than it is today. Experts aren’t sure what triggers lightning, but suspect it could be cosmic rays from outer space.